What could be more bohemian than feathers and fringe? Add a sprinkling of diamonds and you have the perfect boho luxe accessory. Everything about these petite diamond earrings is pure California bohemian chic. 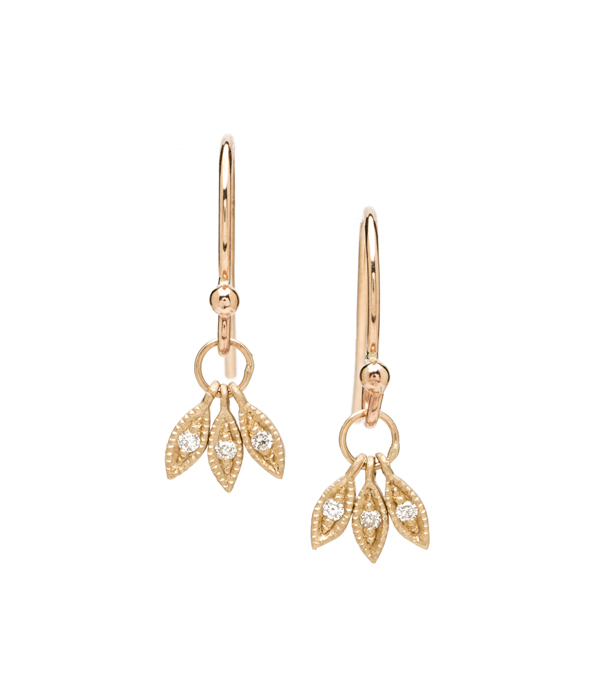 Three marquis shaped gold leaves, each set with diamonds, dance playfully on a delicate gold wire. Elegant and understated, we think these everyday earrings make an lovely gift for the bohemian woman in your life. These gold and diamond earrings feature 0.06 ctw of sparkling diamonds and are handcrafted by our artisan jewelers in Los Angeles. Categories: Alethea, Earrings, Maria's Favorites.